Uncover the impending evils at Universal Studios Singapore’s Halloween Horror Nights 7 in our event guide: with info on haunted houses, scare zones and ticketing information, and more! Note: This is a developing story and we will update with more information as they are uncovered. Cruelty, Deception, Malice, Manipulation, Narcissism, Perversion, Obsession. These new sins personify the vices of our modern life. Manifesting in 7 new and unique icons known as The 7 Sinisters, the 7 deadlier sins have risen from the Abyss, bringing our darkest nightmares to Singapore’s ultimate Halloween event. There’s no better opportunity to use the 7 deadly sins to anchor the 7th event. Lady Death’s cavalcade was so spectacular that so many new evil folks decided to #VisitSingapore. The Sins are responsible for driving the horrors at each new haunt, and they prey on our own misdeeds. We’ve seen something like this happen in the past 2 years – but in 2017, evil no longer comes from the darkness within. So beware. Haunted Houses are walkthrough attractions in enclosed, ‘maze-like’ spaces. Welcome to the Shopping Centre of the Netherworld – where tormented spirits are seeking revenge after a massive tragedy trapped them in hell. You could be the next killer idol of ‘Gore-Pop’! Make a deal of a lifetime to seal your face into stardom… if you can make the cut. The cruel, power-hungry Empress rules from the grave and beyond. Beware the dragon lady, as you escape from her palace and army of TERROR-cotta soldiers. Go inside the mind of evil and be haunted by its inner demons and obsessions. Note: Guests must meet the height requirement of 130cm to experience this haunted house. Trek through a jungle into the hut brimming with dark magic and cursed antiquities. The Midnight Man will ensure that you enjoy a permanent stay. This is shaping up to be one of the darkest editions of HHN in Singapore. We are getting original, non-IP themed houses for HHN7, a decision that will polarise fans of the event again. Despite requests for franchise-based themes in the past years, Singapore’s original house approach has gathered quite a following. There’s one locally themed (Death Mall), two asian themed houses (TERROR-cotta Empress, and Make The Cut). That leaves Inside The Mind and HEX as the token Hollywood/ Western horror houses. The good news is, whatever they are, the stories have a highly cinematic feel this year, like we’ve stumbled in our own horror flicks – starring as the hopeless victims, of course. The headliner house, DEATH Mall, is built inside Soundstage 28, you can bet that the park will spare no expense in recreating unique sights, sounds and things so that you can window-shop till you drop dead. The story seems to be quite inspired by real-life stories of falling ceilings at some malls, and the general decline of brick-and-motor stores in Singapore. So real. 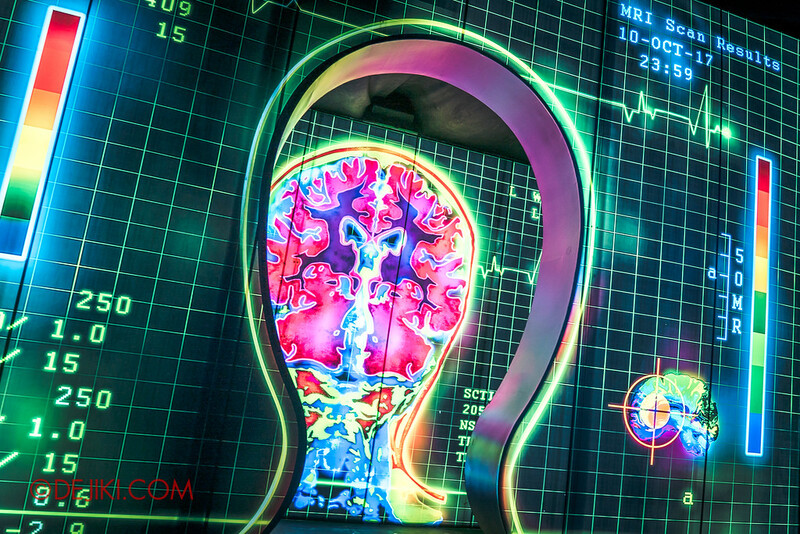 Inside The Mind was originally planned for HHN6, but taken out and resurrected for 2017. Scare zones are interactive experiences outdoors. It is always ‘alive’ throughout event nights and guests can roam at their own pace. The new 7 Sins’ sanctuary is filled with unholy devotees and the upper echelons of evil. Tread carefully into this sacred ground – it is a perilous road to salvation. Holidays are made Horror-days – and this wicked twist will reveal the worst in all of us. At this new ‘survival horror’ attraction, your team of four will fight against flesh-eating zombies and escape an outbreak. Some teammates will wear headbands to detect their concentration level via brainwave technology, which is essential to clear some crucial points in your exciting mission. Separate charges apply for this experience. Pricing details below. Depending on how the park implements the Pilgrimage of Sin scare zone, we’ll either have an eerie, cultish one like last year’s March of the Dead, or swing to the other end – with demons running wild like in Demoncracy (2014). Since the otherworldly festival atmosphere was quite well-received last year, the park might lean towards there (at least for some areas) so that guests can continue to interact with scare actors here and enjoy taking photos with them. Happy Horror Days is likely to stick to the tried-and-test formula for scare zones at Jurassic Park – we’ve had fairy tales, a chinese village, a malay village, and a suicide forest. Now it’s a place for holidays to turn dire. At last, zombies have officially returned – though not in a scare zone (‘Infected’ characters have also been a staple in previous events in Singapore). 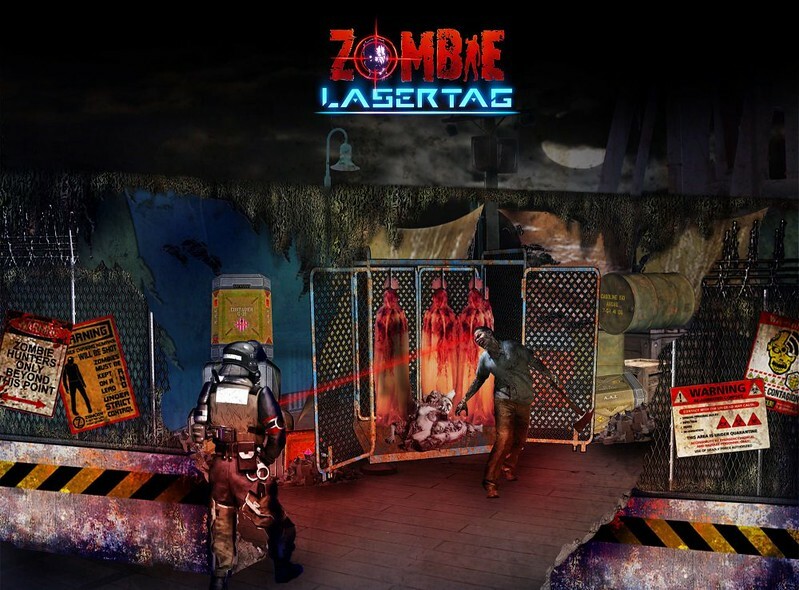 The Zombie Laser Tag experience sounds like a seasonal attraction at Universal Studios Japan, known as Biohazard The REAL. If it is, expect it to sell out during popular times and nights, even with the extra fee. Hopefully the park has a robust system to balance capacity and demand. There will be 2 shows this year, one at Pantages Hollywood Theatre, while the other will be at the Lagoon Stage outside. Jack’s away, so a new sin will be out to play. Step back in time into the period of the Black Death and witness how doctors provided “treatments” for patients then. Proceed with caution – their unconventional curatives may cause unintended side effects. Like past Halloween shows, the Laboratorium will include international stunt acts, and it will be shown at the Pantages Hollywood Theater. The Slit Face Girls is celebrating the launch of their new album with an exclusive fanmeet! Come and see the hottest Gore-Pop girl group perform at the Hollywood Lagoon Stage. Halloween Horror Nights is a separate ticketed event at Universal Studios Singapore. Universal Studios Singapore Day Pass, Annual/Season Pass do not include admission to Halloween Horror Nights. HHN tickets are available for sale at www.halloweenhorrornights.com.sg, Klook online and Universal Studios Singapore ticketing counters. There will also be roadshows at schools, shopping malls and special events. Only purchase tickets from authorised resellers or via RWS directly. You are advised not to buy from unverified sellers online – if the deal is too good to be true, it probably is a scam! Scroll down to the Deals section for HHN7 offers and discounts. Grab the HHN7 admission ticket to gain entry to the park during event nights. Valid for entry to the park during the day and for HHN7 at night. HHN7 Frequent Fear Pass is non-transferrable. Guests are required to register as a passholder during their first visit during HHN7 to create a personalised Photo ID card for this pass. This process takes place at the Membership Lobby inside USS. If you have a USS day-time admission ticket or an attractions membership (season/annual pass) for Universal Studios Singapore, then you can visit the park create your pass before HHN7 officially begins. Skip the long queues for haunted houses and attractions with Express Passes! These passes are add-ons and do not include admission to HHN. *Express Pass are dynamically priced based on demand, and can increase to more than $100 on some nights. BUY HHN7 Express Pass ONLINE via Klook! More details below. Zombie Laser Tag is an attraction where guests work in teams of four. Guests are required to purchase tickets with specific timeslots for their adventure, available at 15 minute intervals from 7:45pm. This experience may be too intense for some guests. Guests younger than 13 years old are not allowed to participate in this attraction. Behind The Screams is a 1.5-hour backstage tour through 2 haunted houses. Read about it here. Visit selected haunted houses with the lights on during the day, and unmask some horrors before HHN7 begins. Beat all the lines and with an exclusive guided tour at Halloween Horror Nights 7. Read my HHN6 RIP Tour review to learn more about the tour experience and guest privileges in 2016! For HHN7, guests will be entitled to: A S$25 Meal Voucher (redeemable for a pre-event buffet), a private Session of Meet & Greet with HHN7 character(s), Buy 1 Get 1 Free Photo Prints, and 10% off F&B and Retail purchases at the park during event night. Email rwstours@rwsentosa.com for enquiries and bookings. 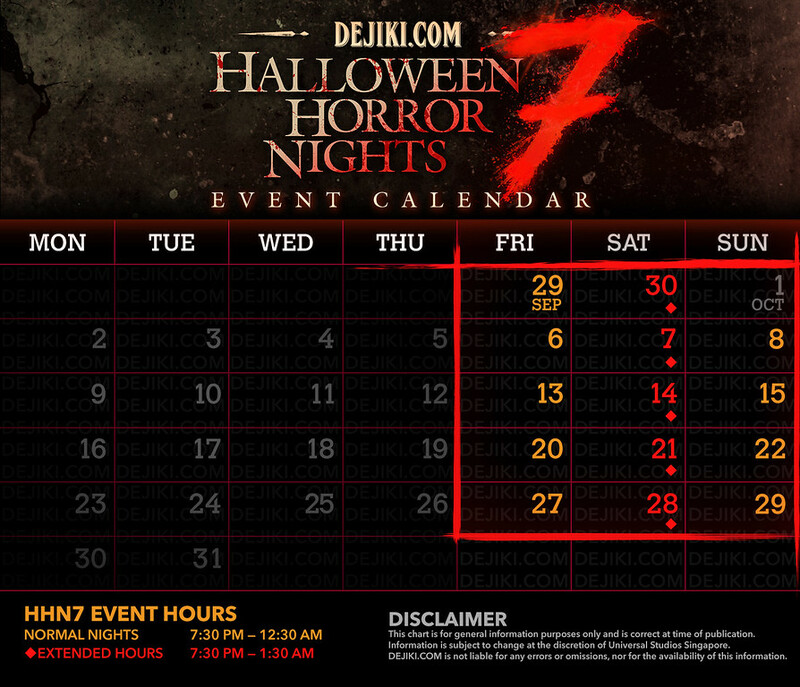 For Klook customers, you can conveniently buy HHN7 tickets online! These tickets are all open-dated unlike those sold on RWSentosa online. Like Klook, Voyagin also offers open-dated tickets. Grab your HHN7 tickets from Voyagin online now! Welcome, new Voyagin users! : First-time users of Voyagin can use the discount code ‘HELLO2’ to enjoy $2 discount off all Singapore activities. More fresh blood, more savings. Loyal regulars, thank you come again, and again. 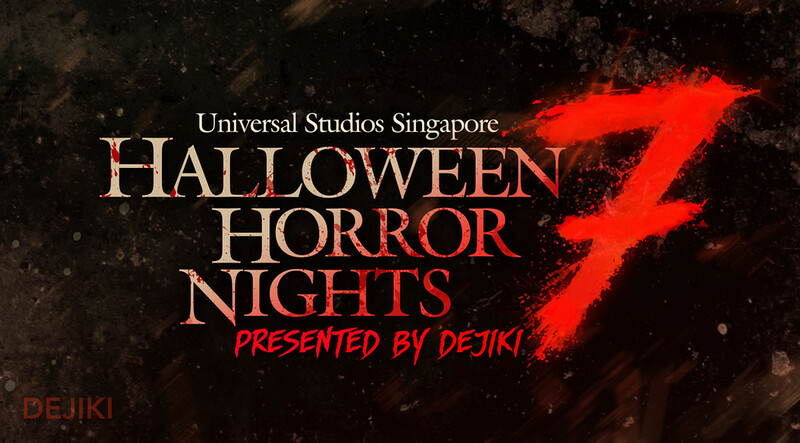 RWS Invites you to Halloween Horror Nights 7. Please show your IDs at the park’s ticketing counters for discounted rate. From now till 7 Sept 2017, enjoy the following discounted rates! TOO LATE. Early Bird has ended. For a limited time, use ‘HHN7ARWSOME’ to claim this deal at rwsentosa.com! TOO LATE. This Offer has ended. We will update this section with more deals for HHN7! Awesome! Can always rely on you to give us the freshes HHN news! I noticed the FFP price was heavily discounted for annual / season pass holders at S$60. Even the BTS tour add on is also priced at S$30. The last time I purchased HHN FFP in 2015 was S$106 for annual / season pass holders. The BTS tour was expensive at that time considering that RIP tour is required – the package price for RIP + BTS tour is at S$238. I wonder what could be the reason for this heavily discounted pricing? It’s likely a loss leader pricing strategy. There are other services and experiences that could bring in revenue. Plus having more crowds at the park helps ensure that Express Pass will sell quickly. So I guess that means the park attendance for HHN6 last year could be declining? Or only for AP/SP holders? P.S. I didn’t buy HHN6 last year as I was saving up on HK Disneyland + Ocean Park itinerary. For HHN6 , I heard complaints that it is not scary enough compared to previous HHN. The fashion parade is nice though. Instagrammers love it .Most people also hate the queuing time. Why declining is mainly the queueing time. Pricing is not much of a issue. Some people read dejiki blog and then decide whether should go based on the scare factors. I go because it is once a year experience. Best time to visit USS. Even if I can’t find friend to go with me especially on non peak days , i still can go alone. Thanks for the update! I tried purchasing the frequent fear pass and had to select a date. Is that date also an appointment to create my photo id? What if I can’t make that date? Is there any way to change it? The frequent fear pass is valid for all 14 event nights during HHN7. The online reservation system is unable to issue such ‘open-dated tickets’, thus you would need to select a date at time of purchase – even though you could use it on any of the event nights. If you purchase the Frequent Fear Pass ticket at roadshows or at the park’s ticketing counters, you would not be asked to select a date. Great job as always! In your opinion, do you think it is possible to do all 5 houses, 2 zones as well as the 2 shows on a Sat based on current crowd levels? The VIP tour is getting more and more enticing (my friend tried it in Universal Orlando to great effect). Thanks. As there are less event nights this year, that seems a bit less possible. Nonetheless, being at the park early and running to the houses at the back can help increase your chances. There’s always the Express option which would guarantee clearing all 5 houses quite quickly, with a steeper price to pay. Seems like they increase the express pass starting price this year..but still it is worth buying for..considering the decrease in number of night..
Do you think the VIP tour is worth the money? I went last year on a Thursday and was able to complete everything and still able to go to the haunted houses for a few more times before leaving. But now there is no Thursday event so I thinking if I should just get the VIP tour to skip the queue. And also, How many times can I skip the queue if I get the VIP tour ticket? As there’s no “off-peak” nights on Thursday, you might want to consider going on Sunday then. The RIP Tour option includes VIP access to haunted houses during the tour. After the tour, you can use your RIP pass for unlimited Express lane access until the park closes. Anyone knows when and where the roadshows will be held? Hi! I was told that the RWS Invites can purchase the Media Night Passes-Is it true? Seems pretty unlikely though top-spending RWS Invites members are sometimes extended invitations to Previews and Media events. First timer here. I bought the The one-day ticket + halloween horror nights for $111. Will there be single rider lines in HHN? If so, will i able to clear all houses? Single Rider lines may be available at certain rides. For haunted houses, there are only Express lanes, which require the purchase of Express Pass add-ons. Whether you can clear all 5 haunted houses depends on crowd levels and the various attractions’ operating capacity. Is there special gift if I buy from roadshow? For example the last year I bought from the road show and they gave a voucher for the blood mug. At the moment, the roadshow gift is a pair of light-up horn headbands with every ticket purchased. With the information we know now, will Inside the Mind be located in the same place as Salem Witch House last year? Inside The Mind is at the same site as Hawker Centre Massacre. Wouldn’t that be the site for Death Mall? The map shows Inside the Mind at the Rockefeller building though. No, Death Mall is built within Soundstage 28 this year, which is right beside Inside the Mind. The entrance to the queue for Inside the Mind is within New York zone, at the Rockefeller Building facade. Inside the Mind has a height restriction on the map of the HHN website requiring guests to be at least 130cm in height to enter. I wonder why this is so? Hi Lionel, due to special effects, there is a height requirement for this attraction. We will know more about this when the event starts, and I will make a note explaining this in the upcoming HHN7 Survival Guide. Hey Dejiki, just wondering. The tickets I bought online the early bird ($55) has been confirmed. I was notified that it is a open date. But when I receive my ticket, it states “valid only by 29 sept”. Hi Daniel, where did you buy the tickets from? For the past 2 nights (6 and 7 Oct), the HHN7 Express and Express PLUS was selling at $90 and $110 at the park. The price might be higher or lower when you purchase.